More than four-in-ten Americans say the country still has work to do to give black people equal rights with whites. Blacks, in particular, are skeptical that black people will ever have equal rights in this country. Americans generally think being white is an advantage in society, while about half or more say being black or Hispanic hurts people’s ability to get ahead. Opinions are more mixed when it comes to what impact, if any, being Asian or Native American has. Most adults, regardless of race or ethnicity, say blacks are treated less fairly than whites in encounters with police and by the criminal justice system, but there’s less consensus about the treatment of blacks in other situations, such as when applying for a loan or mortgage or in stores or restaurants. This chapter also explores what Americans see as obstacles for black people getting ahead as well as attitudes about what impact, if any, the legacy of slavery has on the current status of blacks. A majority of adults say that being white helps people’s ability to get ahead in the country at least a little (59%); 28% say being white neither helps nor hurts and 12% say it hurts. On the flip side, a majority (56%) sees being black as a disadvantage, with 25% saying it hurts people’s ability to get ahead a lot. About a quarter (26%) say being black neither helps nor hurts and 17% say it helps at least a little. More also say that being Hispanic hurts people’s ability to get ahead in this country (51%) than say it helps (18%) or that it neither helps nor hurts (30%). Opinions are more split when it comes to the impact of being Native American – about the same shares say this hurts as say it neither helps nor hurts, while a smaller share says it helps. And while a plurality says being Asian neither helps nor hurts, more say it helps (34%) than hurts (21%) people’s ability to get ahead. Majorities across racial and ethnic groups say being white helps one’s ability to get ahead, though Asians (72%), blacks (69%) and Hispanics (61%) are more likely than whites (56%) to say this. Among whites, education and partisanship are linked to perceptions of white advantage. About three-quarters of whites with at least a bachelor’s degree (72%) say being white helps at least a little, compared with 52% of those with some college experience and 43% of those with a high school education or less. White Democrats and those who lean toward the Democratic Party are about twice as likely as white Republicans and Republican leaners to say being white helps one’s ability to get ahead (78% vs. 38%). 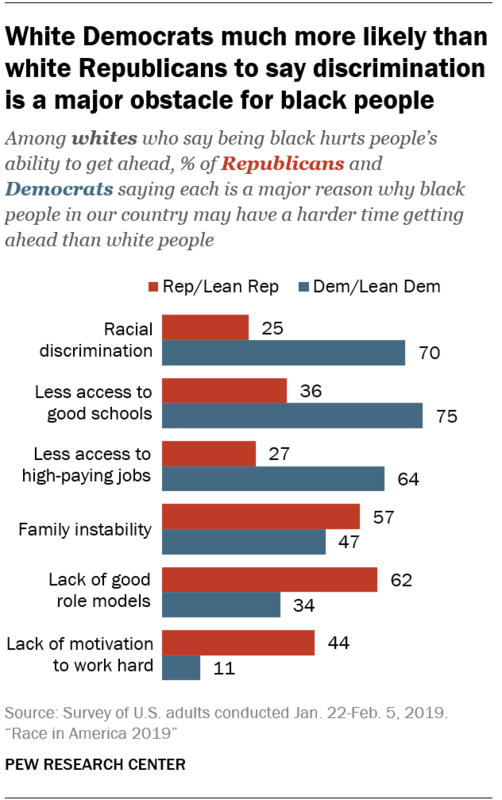 Meanwhile, 22% of white Republicans say being white hurts people’s ability to get ahead at least a little (compared with 3% of white Democrats). White Democrats are more likely than black Democrats to say whites have an advantage (78% vs. 71%). Among blacks, 76% of those with a bachelor’s degree or more education say being white helps a lot, compared with 61% of those with some college and 49% of those with a high school diploma or less education (a majority in this group – 57% – says being white helps at least a little). And while about six-in-ten blacks ages 30 and older say there’s a lot of advantage in being white, about half (49%) of those younger than 30 say the same (again, majorities of blacks across age groups say being white helps at least a little). 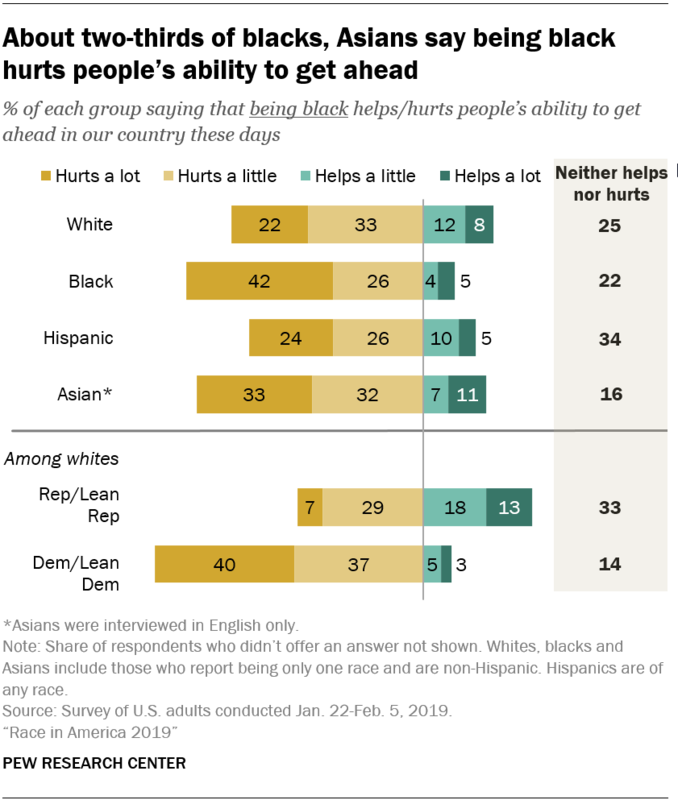 Asked about the extent to which being black helps or hurts one’s ability to get ahead, 68% of blacks and 65% of Asians say being black hurts at least a little; 55% of whites and half of Hispanics say the same. Blacks are more likely than other racial or ethnic groups to say being black hurts a lot: 42% say this vs. a third or fewer among Asians, whites and Hispanics. Among whites, blacks and Hispanics, those with at least a bachelor’s degree are more likely than those with less education to say race hurts blacks’ ability to get ahead. Some 81% of black college graduates and 74% of those with some college say this, compared with 57% of those with less education. White Democrats and white Republicans differ widely in their perceptions of the challenges blacks face. About three-quarters of white Democrats (77%) say being black hurts people’s ability to get ahead at least a little; 36% of white Republicans say the same. Three-in-ten white Republicans – vs. 8% of white Democrats – say being black helps. While blacks are more likely than people in most other racial and ethnic groups to say being black is a hindrance in getting ahead, just the opposite is true for Hispanics. Hispanics are the least likely to say being Hispanic hurts people’s ability to get ahead. Fewer than half of Hispanics (46%) say this, while higher shares of Asians (60%) and whites and blacks (52% each) say the same. Among Hispanics, views differ by nativity. Hispanics who were born in another country are about evenly split between those who say being Hispanic hurts (37%) and those who say it neither helps nor hurts (36%); 54% of Hispanics born in the U.S. say being Hispanic hurts people’s ability to get ahead at least a little. The survey also asked about the extent to which other attributes, beyond race and ethnicity, help or hurt people’s ability to get ahead. Large majorities say being wealthy helps (89%) and being poor hurts (86%). Most say that being a man gives people an edge (65%), while 51% say being a woman puts people at a disadvantage. When it comes to different religious groups, most say that being Muslim makes it more difficult to succeed in American society (63% say this), while majorities say that being Jewish (55%) or an evangelical Christian (54%) neither helps nor hurts. Women are more likely than men to say that being a woman hurts a person’s ability to get ahead (58% vs. 43%) and that being a man helps (72% vs. 59%). These gender gaps are particularly pronounced among whites. More than half (56%) of Americans say being black hurts people’s ability to get ahead at least a little. When those who say this are asked why black people in the U.S. may have a harder time than white people getting ahead, more point to racial discrimination and less access to good schools and high-paying jobs as major reasons than to family instability, lack of good role models and lack of motivation to work hard. Blacks and whites don’t see eye to eye on many of these items. Among those who say being black hurts people’s ability to succeed, 84% of blacks – vs. 54% of whites – say racial discrimination is a major reason why blacks may have a harder time getting ahead. The gap is nearly as wide when it comes to the shares of blacks and whites saying less access to high-paying jobs is a major obstacle for black people (76% vs. 51%). Blacks (72%) are also more likely than whites (60%) to point to less access to good schools. Meanwhile, whites who say being black hurts a person’s ability to get ahead are more likely than blacks to cite family instability (50% vs. 42%, respectively) and a lack of good role models (45% vs. 31%) as major obstacles. Whites and blacks are equally likely to say a lack of motivation to work hard is a major reason – 22% of each group. Most Hispanics who say being black hurts people’s ability to succeed see racial discrimination (65%) and less access to good schools (70%) and high-paying jobs (61%) as major obstacles for blacks. But Hispanics are more likely than whites and blacks to point to a lack of motivation to work hard as a major reason why blacks may have a harder time getting ahead than whites: 35% say this, a view that is more common among Hispanics born abroad (43%) than among those born in the U.S. (31%). Among whites who say blacks face disadvantages, views on the obstacles black people face vary by age, education and partisanship. Most white Democrats who say being black hurts one’s ability to succeed cite racial discrimination (70%) and less access to good schools (75%) and high-paying jobs (64%) as major obstacles, compared with about a third or fewer white Republicans. In turn, white Republicans are more likely than white Democrats to point to family instability, lack of good role models and a lack of motivation to work hard. About two-thirds of Americans say that blacks are treated less fairly than whites in dealing with the police (67%) and by the criminal justice system (65%). The public is more split on whether blacks are treated less fairly than whites or about equally when it comes to hiring, pay and promotions, applying for a loan or mortgage, or in stores or restaurants. And most believe whites and blacks are treated about the same when voting in elections (60%) and seeking medical treatment (63%). Meanwhile, very small shares think whites are treated less fairly than blacks in any of these situations. On many of these items, the views of whites and blacks are nearly opposite. 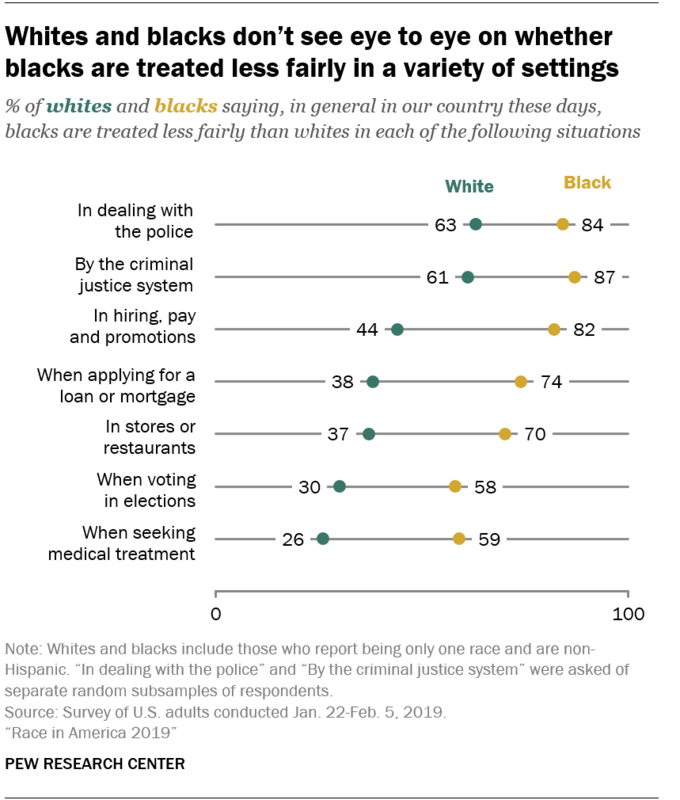 The only situations in which majorities of both groups – but still, far larger shares of blacks than whites – say blacks are treated less fairly are in dealing with police and by the criminal justice system. Majorities of black adults say blacks are treated less fairly on all the items. In fact, blacks are about twice as likely as whites to say that blacks are treated less fairly when seeking medical treatment, applying for a loan or mortgage, voting in elections, in stores or restaurants, and in hiring, pay and promotions. Hispanics have similar views to whites when it comes to how blacks are treated by police (65% of Hispanics say blacks are treated less fairly than whites) and the criminal justice system (64% say blacks are treated less fairly). In all other situations asked about, the views of Hispanics fall between those of whites and blacks. Among whites, blacks and Hispanics, those with bachelor’s degrees are consistently more likely to believe blacks are treated less fairly in a variety of situations. For example, 53% of whites with a bachelor’s degree or more education say blacks are treated less fairly when applying for a loan or mortgage, compared with 34% of whites with some college experience and 26% of those with a high school diploma or less. Younger whites, especially those younger than 30, also tend to be more likely to see inequality in the way blacks are treated. For example, 77% of whites younger than 30 say blacks are treated less fairly by the criminal justice system, compared with 63% of those ages 30 to 49, 49% of those 50 to 64 and 59% of those 65 and older. White Democrats and Republicans have vastly different views of how blacks are treated relative to whites. About four-in-ten white Republicans say blacks are treated less fairly by the police (43%) and the criminal justice system (39%), compared with 88% and 86% of white Democrats, respectively. In other situations, the gaps are even wider. Only 7% of white Republicans say blacks are treated less fairly when voting in elections, but a majority of white Democrats (60%) say the same. White Democrats are also far more likely than white Republicans to say blacks are treated less fairly when seeking medical treatment, in stores or restaurants, when applying for loans, and in hiring, pay and promotions. 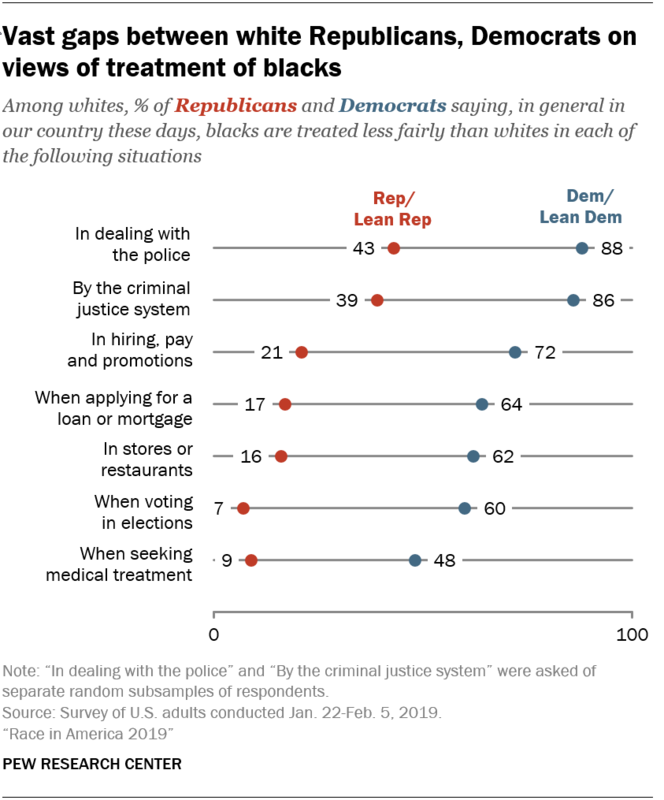 Similar shares of white and black Democrats say black people are treated less fairly than whites in dealing with the police, by the criminal justice system, and when voting in elections. Black Democrats are more likely than their white counterparts to say this is the case in hiring, pay and promotions (86% of black Democrats say black people are treated less fairly), when applying for a loan or mortgage (78%), in stores or restaurants (73%), and when seeking medical treatment (61%). More than four-in-ten U.S. adults (45%) say the country hasn’t gone far enough in giving blacks equal rights with whites; 15% say it’s gone too far and 39% say it’s been about right. Among those who say the country still has work to do, most think there will eventually be racial equality, but views on the country’s racial progress so far and in the future vary considerably across racial and ethnic groups. About eight-in-ten blacks (78%) say the country hasn’t gone far enough in giving black people equal rights with whites. Among whites, 37% say the country hasn’t gone far enough, while 19% say it’s gone too far and 43% say it’s been about right. Hispanics fall between whites and blacks, with 48% saying the country has not gone far enough in giving blacks equal rights with whites. Similar shares of blacks across age groups say the country hasn’t gone far enough when it comes to giving black people equal rights with whites. And large shares of blacks across education levels say this is the case, although those with a bachelor’s degree or more education are particularly likely to do so: 87% say the country hasn’t gone far enough vs. 77% of those with some college and 75% of those with less education. Among whites, those under 30 are much more likely to say the country still has work to do to achieve equality between blacks and whites – 51% say this, compared with 38% of whites ages 30 to 49, 28% of those 50 to 64 and 37% of those 65 and older. There are also differences by education, with whites with at least a bachelor’s degree more likely than those with less education to say the country hasn’t gone far enough on this issue. White Democrats and Republicans also differ widely in their assessments of the country’s progress on racial equality. Most white Democrats (64%) say the country hasn’t gone far enough in giving black people equal rights with whites. Among white Republicans, about half (53%) say it’s been about right, while a sizable minority (31% vs. 5% of white Democrats) say the country has gone too far. Black Democrats are even more likely than white Democrats to say the country still has work to do: 82% say it hasn’t gone far enough in giving black people equal rights with whites. Most blacks (64%) who say the country hasn’t gone far enough in giving black people equal rights with whites – and half of all black adults – say it’s not too or not at all likely that the country will eventually achieve racial equality. Whites who say the country still has work to do on this front are more optimistic: 80% say it’s very or somewhat likely that black people will eventually have equal rights in this country. Hispanics’ views are more mixed. Of those who say the country hasn’t gone far enough in giving black people equal rights with whites, 54% say this is likely to happen eventually and 46% say it’s not too or not at all likely. For the most part, Americans believe slavery continues to have an impact on black people’s status. About six-in-ten U.S. adults say the legacy of slavery affects the position of black people in American society today either a great deal (31%) or a fair amount (32%). Some 36% say slavery doesn’t have much or anything at all to do with the current situation of black people. Blacks are by far the most likely to say slavery continues to have an impact. More than eight-in-ten say slavery affects the position of black people at least a fair amount, including 59% who say it does so a great deal. By comparison, 26% of whites, 29% of Hispanics and 32% of Asians say slavery affects the situation of black people today a great deal, though majorities of each group say it does so at least a fair amount. Among whites, 18- to 29-year-olds are the most likely to say slavery still has an impact today. About two-thirds of whites in that age group say this (68%), compared with 55% of 30- to 49-year-olds, 54% of 50- to 64-year-olds and 60% of those 65 and older. Age differences are less evident among blacks. Education is also associated with views of whether slavery still has an effect today, and this is the case among whites and blacks. Whites with a bachelor’s degree or higher (67%) are more likely to say that slavery continues to have a great deal or a fair amount of influence on black people’s position in society, compared with 56% of those with some college experience and 50% of those with a high school diploma or less. Blacks with at least a bachelor’s degree or some college experience (90% of each group) are also more likely than those with a high school diploma or less (76%) to say this. White Democrats are twice as likely as white Republicans to say that the legacy of slavery has had a lasting impact (80% vs. 40%). Black Democrats are even more likely to say this is the case (87% do so).